Enhance the beauty of your mane with the new Wella Luxe Oil Reconstructive Elixir, that is formulated using the latest technology with a unique blend of exotic oils of Almond, Argan and Jojoba that nourishes and smoothens your hair. This special formula with complete keratin protection transforms dry, brittle hair to give you salon style silky hair.It softens damaged and brittle hair without weighing it down, making it easy to style it in a way you desire. 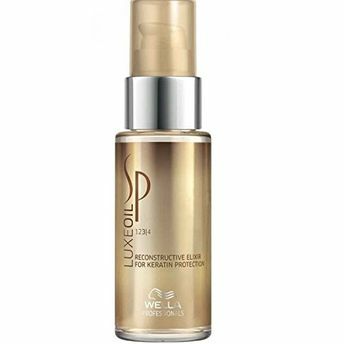 The Wella System Professional Luxe Oil, with nurturing and enriching oils from around the world, creates liquid luxury for your hair giving you all dazzling shine and glossy finish! Prevents mechanical stress on the hair. Additional Information: A world renowned German hair care professional brand, Wella Professionals specializes in variety of innovative, high performance salon hair care products, trendy hair color ideas and styling products to give you beautiful, shiny and strong hair. The product range includes shampoos, conditioners, hair oils, hair treatment and various hair styling products that suit all hair types. Explore the entire range of Hair Oil available on Nykaa. Shop more Wella Professionals products here.You can browse through the complete world of Wella Professionals Hair Oil .Alternatively, you can also find many more products from the Wella Professionals SP LuxeOil Reconstructive Elixir For Keratin Protection range.